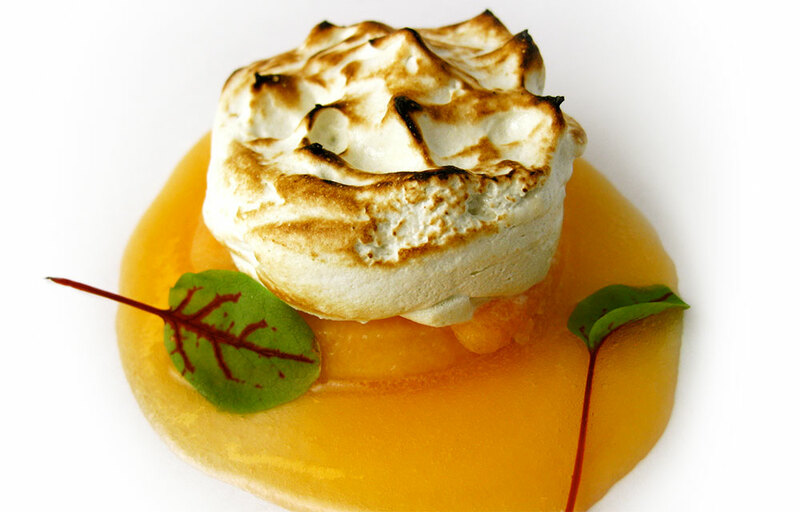 Every dish I create has many different components to it, all of which are treated with the same level of care. At each event, I explain as much as possible to the guests about what went into the creation of the dish being served during that evening. The more you know about a dish, the more you enjoy it, since the explanations validate the great flavors you are already experiencing. For example, imagine you are enjoying a great wine that you may be unfamiliar with. 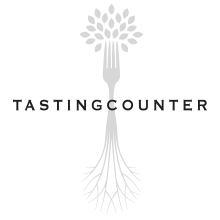 The sommelier describes notes of blackberry, tobacco, and licorice, and immediately you begin to appreciate the wine even more than before, having added an extra layer of experience to the tasting process. I start with the most basic, simple, raw, unprocessed ingredients available. If I can’t find it in this form, I won’t buy it and won’t use it. 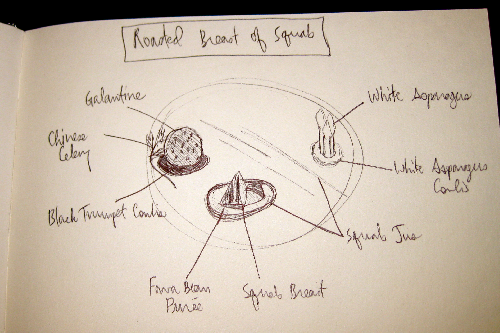 For the squab dish, I start with whole squabs, and use every part of the bird in the creation of this course. The breasts are carved out, legs separated, and the carcasses are used as well. 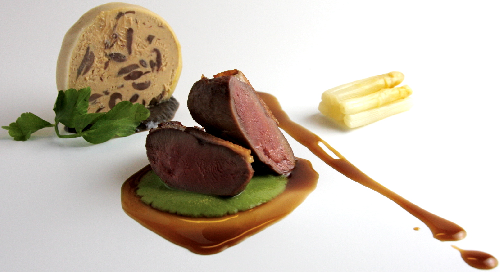 Each component will add a different element to the finished dish, culminating in an experience that brings out the true essence and flavor of the squab. 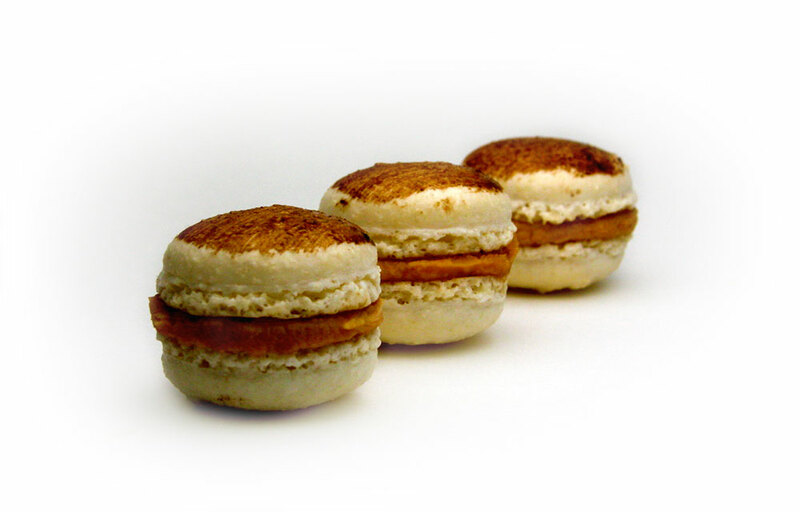 Although they are wonderful simply roasted whole, when its components are separated, I am able to bring different qualities to the plate from the same ingredient, simultaneously creating variance and harmony. 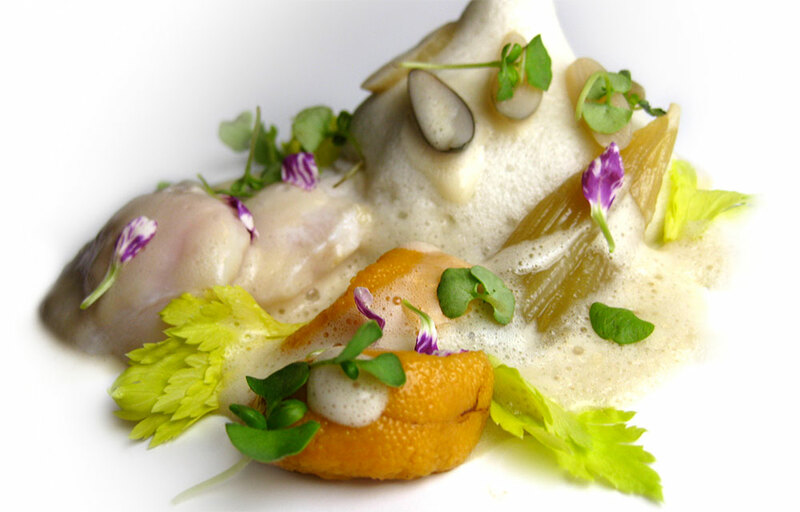 This provides the guest a holistic experience with the dish, not simply a series of great flavors. Confiting the legs begins with a cure. In a mortar and pestle, a mixture of salt, sugar, thyme, peppercorns, and bay leaves are crushed together. The cure is generously rubbed all over each leg. I am being conservative with the flavors in an effort not to mask the delicate taste of the bird, as well as not compete with other rich flavors, on their way to the plate. After 24 hours, the cure is thoroughly rinsed off in cold running water. 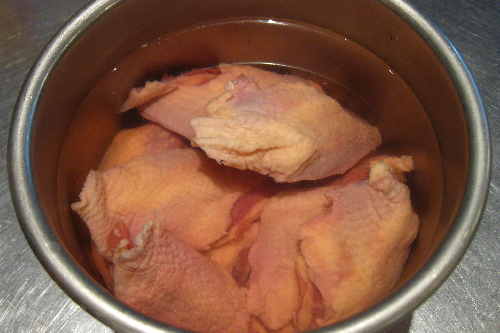 The legs are patted dry of all excess moisture and completely submerged in olive oil. It then goes into a 90°C oven for approximately 8 hours. Afterwards, it’s allowed to cool to room temperature before being refrigerated, where it should stay at least overnight, but could last several weeks. The breasts are first brined in a simple 5% salt solution for 24 hours. Often, it’s nice to bring in other accompanying flavors with the brine, but I know that there will be other full-flavored components on the plate, and want the quality of the bird to speak for itself. 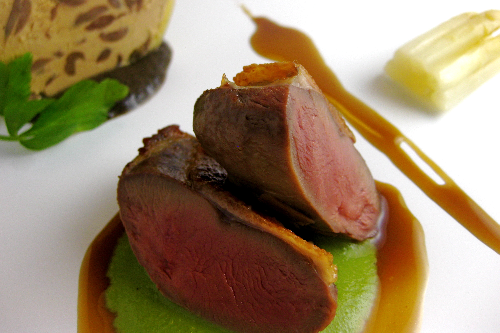 Squab breast is a dark meat that, when cooked properly, tastes great as is. Moreover, after rinsing it thoroughly in cold running water following the brine, it’s patted dry, cryovaced with butter and thyme, and cooked at 50°C for 20 minutes. Then it’s chilled in an ice bath, before being put in the fridge to await the next day’s dinner. It’s now time to make use of the rest of the bird, which will add the most flavorful component to the dish – the squab jus. The carcasses are roasted in a high oven (approximately 225°C) for about 30-40 minutes, looking for a nice, deep brown color. The bones are rotated and flipped throughout the process to ensure even caramelization. 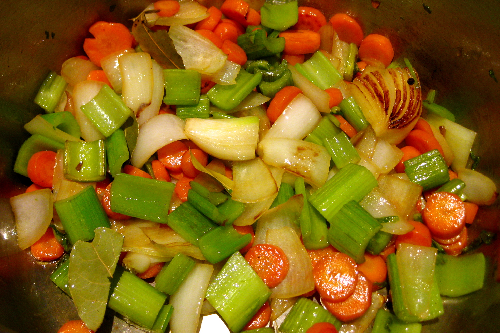 Meanwhile, mirepoix vegetables are sautéed until lightly colored. To this, I add enough white wine to cover the vegetables, and let it reduce until the alcohol smell has completely dissipated. 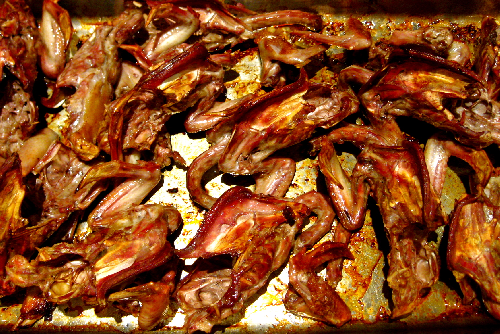 All the roasted bones are added, along with just enough water to leave about an inch of bones above the water line. As the squab stock comes to a simmer, the bones are carefully pushed down into the water, trying to avoid crushing any of the vegetables. 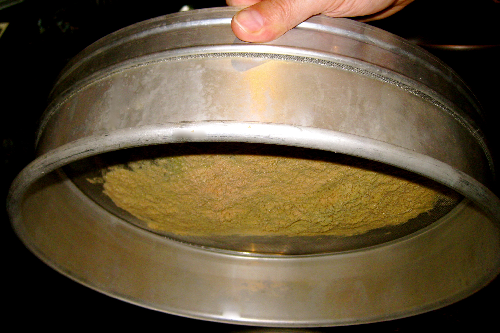 After approximately 6 hours, during which time any impurities are occasionally skimmed from the surface, the liquid is strained through a sieve into a smaller pot. The stock continues to simmer gently and reduce, while constantly skimming all impurities collecting on top. As the jus reduces to gain body and intensify flavor, it’s tested on a plate to see how the final product looks. 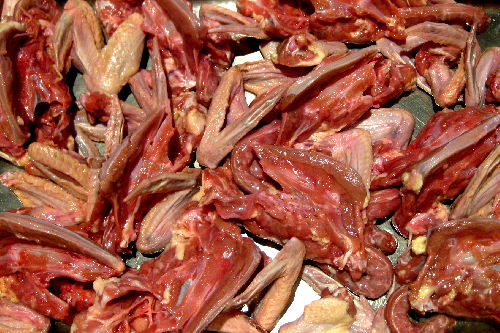 Usually, there is not enough gelatin extracted from tiny squab bones in order to create the consistency needed. There is also the risk of over-reducing the sauce, in which case the flavors might be either too concentrated or lost altogether. 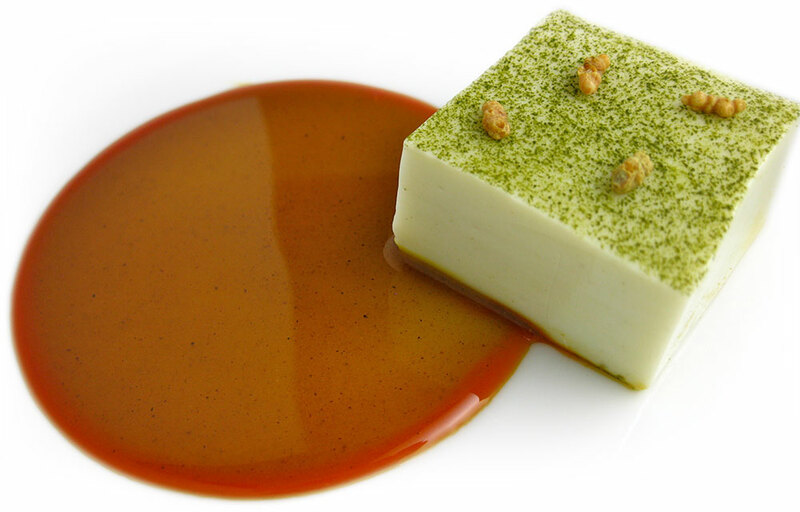 In order to achieve the right consistency, while achieving maximum flavor, an arrowroot slurry is cooked into the sauce. Arrowroot thickens the sauce quickly, and since it’s tasteless and colorless, will not affect the flavor of the jus. 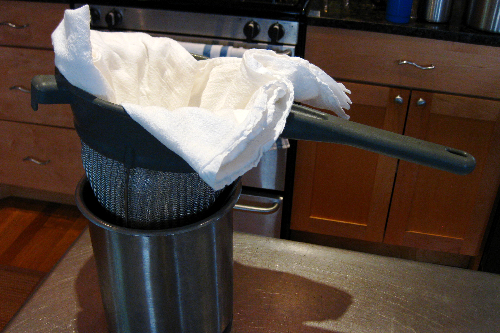 Once it’s at the proper sauce-like consistency, I strain it gently through a food-safe cloth-lined chinois, which removes all micro-particles and gives the final jus a clear, beautiful sheen. For the galantine, I allow the squab leg confit to come to room temperature before lifting out from its olive oil bath. All the meat is picked clean from the bones, skin, and sinew. Then, I lightly season the foie gras lobes and cryovac them to cook in a water bath at 68°C for 25 minutes. Afterwards, the foie gras chills in an ice bath for at least 1 hour. It is removed from the bag to be passed through a tamis. 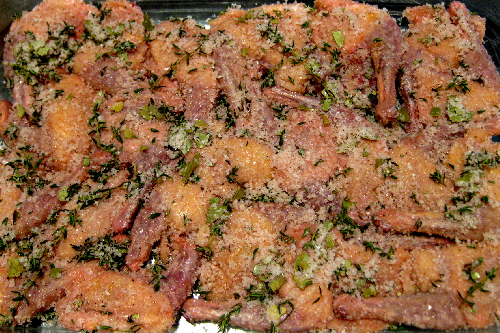 The resulting mixture is folded in with the picked confit squab leg meat, while the seasoning is adjusted. 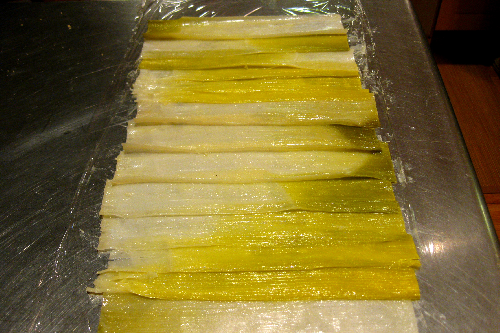 The leeks are cryovaced (split in half and thoroughly washed) with salt, white pepper, and whole butter. It’s cooked in an 88°C water bath for about 3 hours, but this time can vary and may be checked by pinching a small portion through the bag to feel for doneness. I take them out and let them rest at room temperature (no ice bath this time, since I don’t want the butter to solidify). 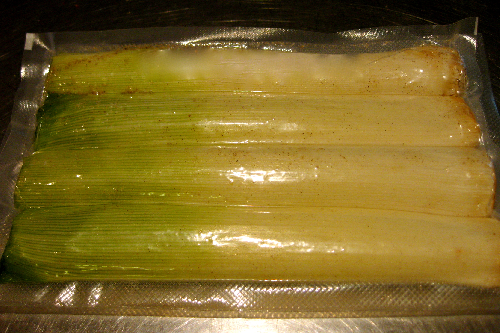 Once cool, I take out the leeks, trim off the core end, and line them up staggered on top of plastic wrap, overlapping about half an inch on each side. 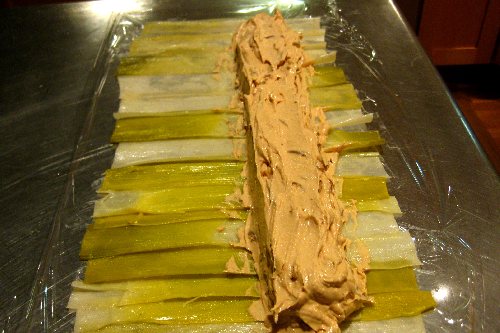 The foie gras-squab leg mixture is evenly molded along one side of the leeks and gently rolled up, with the assistance of the plastic wrap. After checking to ensure all air has been removed from the product, I place it in the fridge to chill and firm up. 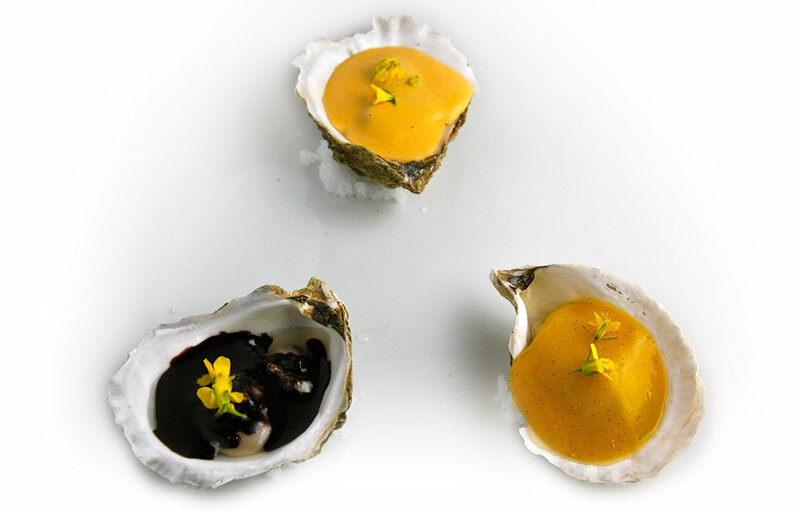 Although traditional galantines are first formed, and then cooked by poaching, this version is done backwards, with the “poaching” process done in a vacuum-sealed bag for the foie gras, and in olive oil for the squab legs. For the final preparation of the dish, the squab breasts are removed from their bag, discarding all thyme stems and solidified butter. The meat is gently patted dry and allowed to sit at room temperature for approximately 30 minutes. They are seasoned with kosher salt and white pepper, and seared in a moderately hot pan, initially with olive oil, and once the skin begins to color, whole butter and additional fresh thyme sprigs are added. 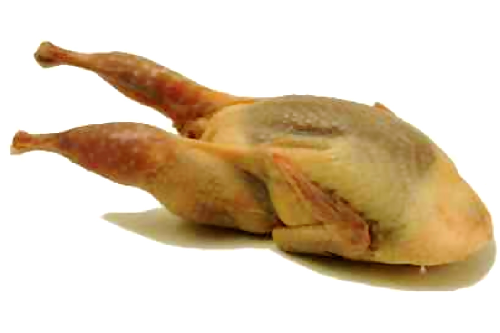 The heat is reduced while repeatedly basting each individual breast, always keeping them skin-side down, never flipping. Once the skin is golden brown and a thin needle (or cake tester) inserted into the breast comes out warm, they are cooked enough, and transferred to a wire rack to allow to rest, while all excess fat drips away. Each breast is sliced once on a sharp bias for the presentation on the dish. The squab jus is warmed gently, not being reduced any further, and a generous portion of the galantine is sliced, using a thin knife dipped in hot water and wiped completely clean between slices. So concludes “It’s All In A Dish,” without even getting into the braised white asparagus in its sauce, fava bean purée, and black trumpet mushroom coulis. However, the focus of this post highlights how our whole squab bird was first taken apart, and then brought back together on the plate, while ensuring proper use of the entire product to maximize the dining guests’ enjoyment of the course. Our sommelier pairs a 2005 Domaine Catherine Le Goeuil Cairanne (with details here and here) as the wine accompaniment.